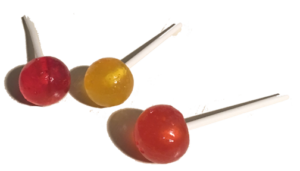 Original Gourmet (OG) sent us a load of their Sweetly Naturals lollipops and we were happy to review because 1. we liked their previous wares a lot, and 2. we’re always interested in reviewing the (supposedly) healthier sweet treats. The initial OG lollipops we reviewed had fun flavors like blueberries and cream and cherry cheesecake. I took a load of these to work and people pounded them. Today’s Sweetly Naturals mainly have your typical flavors, such as Strawberry & Watermelon, while throwing in a few semi-curveballs like Meyer Lemon and Blood Orange. Where these Sweetly Naturals differ with their brethren, is in the ‘natural’ area. These are GMO Free, without high fructose corn syrup, gluten or peanuts. These pops are also made using natural colors and flavors. Here’s the thing, I’m not convinced these are truly healthy, and maybe more importantly, I didn’t love the flavors. Ok they don’t have HIGH fructose corny syrup, but corn syrup is still the #2 ingredient, after sugar. Yes, they don’t have peanuts…but do any lollipops have them, besides peanut flavored ones? Feels like a marketing message, not an innovative way to make pops. Also, the colors and flavors might be natural, but as nutritionists have pointed out, not much distinguishes natural from artificial flavors. The blood orange…hmm…When I first tried this one, I had no idea what it was. It tasted strangely sour. Not like a Sour Patch Kid, but like an ‘off’ taste, like you might think something’s wrong with it. Then I looked at the flavor listed on the wrapper and I was like ‘OOOOoooooohhhh riiiight. yeah. That IS blood orange.’ And then I kinda liked it’s originality. The Meyer Lemon tasted very sweet lemon but not necessarily super lemony. Sorry, but these won’t make it back on my work shelf for my peers to steal. But I will go back and buy the ones with awesome flavors we initially reviewed.